I’ve forgotten so much about my wedding day. I can’t remember cutting the cake and I don’t remember my first dance. I don’t remember what I said in my vows and my wedding speech was an unparalleled disaster. But one moment is tattooed on my memory, etched so powerfully I doubt it’ll ever leave. My wife and I just exchanged rings. I looked down at my hand and it looked strange. Different. Like it didn’t belong to me. It looked like the hand of an older man. Before my fingers seemed lean and delicate, now they looked gnarled and thick.. In that moment I thought I was looking at my father’s hand. I cannot explain to you in words how weird that felt. How good is Firewatch, right? It’s pretty damn good, tremendous even, with writing that’s not just good in that patronising way (“it’s good… for a video game”) but in a general way. Firewatch is a very lonely video game that’s all about people. There are two things that stood out for me. The first is a moment, early in the game. Fireworks are being set off illegally and you’re asked to investigate. The perpetrators turn out to be two surly teenage girls. As you approach their clothes are strewn throughout their campsite. It becomes increasingly clear they are skinny dipping in a nearby lake. You approach. You tell them off from a distance. You never really see the teenage girls but you hear their voices, berating you – calling you a pervert, overweight, weird, gross. We’re not used to this in video game land. We’re used to being the hero, we’re used to being empowered. We’re not used to being verbally abused and belittled by snarky teenagers. We’re not used to feeling uncomfortable in our own digital skin. We’re not used to being forced into a sense of self-loathing. The second was more subtle, but I noticed it almost immediately: your wedding ring. In Firewatch, Henry — the protagonist — wears a wedding ring. Again, we’re not used to wearing wedding rings in video games. A few spring to mind. Most recently, Fallout 4 allowed its players to keep (and wear) its protagonist’s wedding band after your wife is murdered. 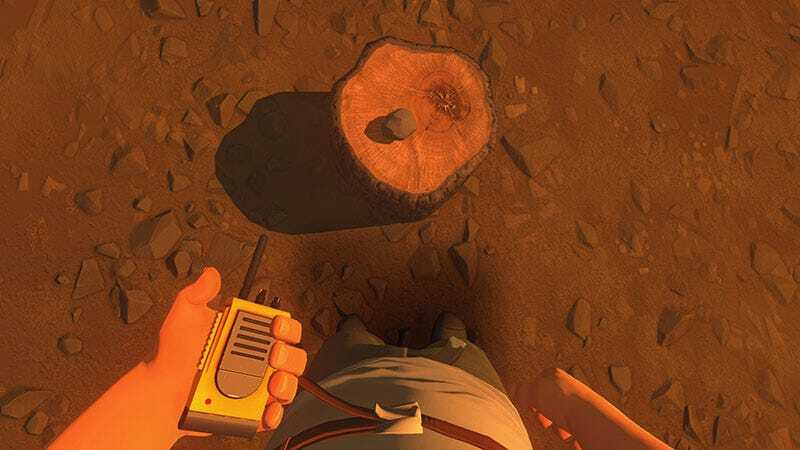 In Firewatch your wedding ring is inescapable. Each time you climb up a rock wall or scramble into a crevass your wedding is there, visible: emblematic of a relationship that sits silently at the centre of Firewatch’s narrative. Your absent wife, who you’ve left in Melbourne, Australia, is represented by that ring. It’s a constant reminder that your escape, your avoidance, is just a temporary solution. It’s Edgar Allen Poe’s Tell-Tale Heart, beating beneath the floorboards. It’s the visible representation of your regret and shame. But despite the ring’s visibility in the early stages of Firewatch, I didn’t even notice when Henry removed it. It was a slow burn. At first I stopped thinking about the ring, took it for granted. Later when, reminiscing on its initial impact, I tried to look for it. Was it still there? Was it gone? Before Henry’s wedding ring was so visible, now I couldn’t see it at all. And in the context of the narrative, that absence is so powerful. Slowly, you/Henry are in the process of developing a relationship with Delilah, your supervisor, a person you’ve never seen but is constant presence in Firewatch. You gives you instructions, you make small talk. It’s clear something is developing there. Mid-way through the game Henry takes a phone call from Julia, his wife, but he sounds distant, eager to end the conversation. With Delilah he’s content to talk and talk. Henry initiates. He is present. I don’t actually wear my own wedding ring. I have a friend, we used to play football together. One day, when I wasn’t playing, he hit a wayward shot and fired the ball over a high fence. Instead of going around, my friend decided to climb the fence. At the top he slipped and his ring got caught. Almost instantly his finger was degloved, the skin and muscle tissue completely torn off. He was in shock. He wandered around in circles saying, ‘where’s my finger’, ‘where’s my finger’, ‘where’s my finger’. So yeah, that spooked me on rings in general. Four years ago I took up rock climbing as a hobby. With my friend’s story in mind, I removed the ring before climbing. When I started going more regularly I wondered if it was worthwhile putting it back on. One day I forgot. I left it off and I never put it on again. No big deal. I remember wondering – Henry does a lot of climbing in Firewatch, maybe he had the same excuse. And every time I think about putting my ring back on I remember my wedding day. I love my wife, we have an incredible relationship and there’s no ‘Delilah’ in my life, but when I think about wearing my wedding ring again it makes me feel funny. I remember the strangeness of my wedding day. I remember looking down at my hand and not recognising what I saw. Later, in Firewatch, I found Henry’s wedding ring, sitting on a table next to the radio I used to call Delilah I picked it up. The game gives you an option: it asks you if you want to put the ring back on. This time, as Henry, I decided to wear it.